My name is Yandi, I am freelance designer focusing on UI design.Currently living in Bandung, Indonesia. Feel free to contact me anytime via message or 1 to 1 project directly. 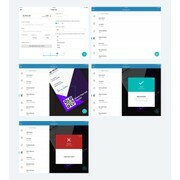 ""I've been working with the designer named "Raptor Design" for 3 projects: he won my little contest and I offered him 3 more mobile app projects. He was good as a designer: quick, responsive and agile. We've been working together for 5 months. He finish..."
"The designer is very cooperative, quick responding, talented and hardworking! I'm going to have future 1-to-1 projects with him. Thanks!" "Great working with this designer. Quick to make changes as needed. Great ideas and fresh designs." "Awesome job again with a landing page creation. Very fast and spot on with the design!" "very collaborative designer. very open minded, involved in the project at all phases of the competition, i ask several updates, he was always one of the first. 100% reco"
"Great work, very reactive and comprehensive." "We needed a LP redesign. Great work by all participants." "Raptor Design was fabulous! Very clean, sophisticated design and very responsive. Turnaround on design requests were very quick!" "Very responsive person. Swift responses to our demands. Professional attitude." "Great designer, real fast and very very good!!" "Great Designer, quick on updating my alterations"
"Excellent work and quick turnaround for revisions. Will definitely use Raptor Designs again. Highly recommended!"